We've had a few days without internet reception and power so I haven't been able to any blog updates. But I have both for the moment so I will try and get in as much in as I can. At Laura we locked up Myrtle (camper) safe and sound and started on the 700+km dirt Peninsula Development road. We really had no idea as what to expect as there had been lots of recent rains. We had also been told there were some patches sealed but we had no idea how much or where. Some people said let air out of your tyres and some said don't! There was so much conflicting information we decided to just take it as it comes and see how we go. We also decided to let the tyres down to about 28psi for a smoother ride. First stop was at Hann Roadhouse for Shane to have something for breakie. Then it was my turn to drive and wouldn't you know it, it was the worst surface we drove on all day, there were bumps, potholes all over the place. There were a few sections that were sealed which made the rough bits easier to deal with. We also crossed lots of creek/river crossing with about eight still having water flowing across the road. Next stop was Musgrove Telegraph Station, where we were going to spend the night. But as it was only 12.30pm we decided to head on further. So we filled up with petrol and headed off. Of course the road was great now because Shane was driving! We reached Coen at about 2.30pm and pitched our tent at the back of the Coen Exchange Hotel for $10 for the night. After cooking ourselves ribs we had an very early night. We headed off early from Coen, packing up on a very dewy morning. Today our destination where we will lay our head will be the mining town of Weipa on the western side of the cape. The road was pretty good with a few sealed sections but even the unsealed sections were pretty smooth. After crossing the quarantine station we drove onto Archer River Roadhouse. We stopped here to get fuel and even though it was only 10.00am decided to have an early lunch. Before the Weipa turnoff we struck a very long stretch of roadworks where the road became very slippery and slidey. Yes, guess who was driving again - me!! 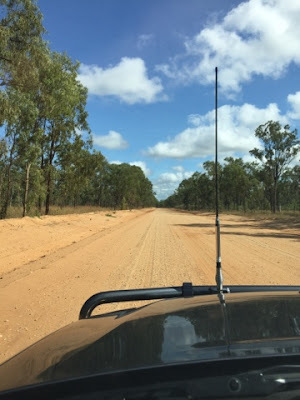 The road to Weipa started out pretty good but became very bumpy and had a lot of potholes. 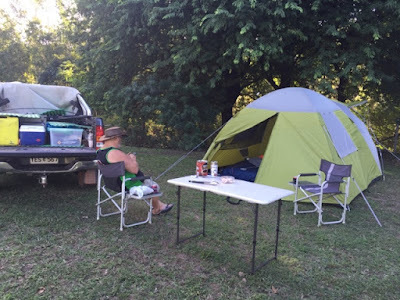 We arrived in Weipa at around 2.00pm and set up our tent in a nice shady spot in the Weipa Caravan Park. We had a lovely spot overlooking the ocean, but no swimming here due to those big things with sharp teeth - crocs!! Today was a bit of a lazy day, the only thing we did was have a look around. 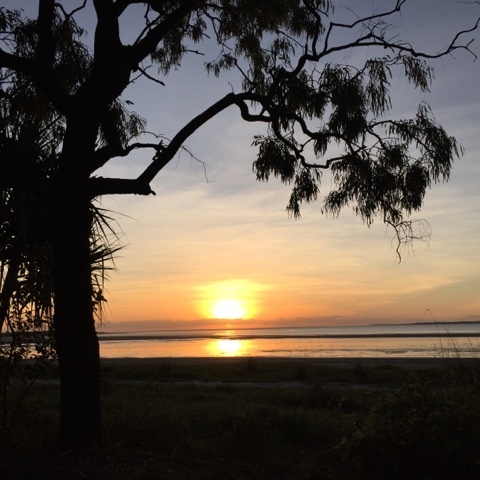 Weipa is the largest town on the Gulf of Carpentaria coast of the Cape York Peninsula with a population of around 3000. 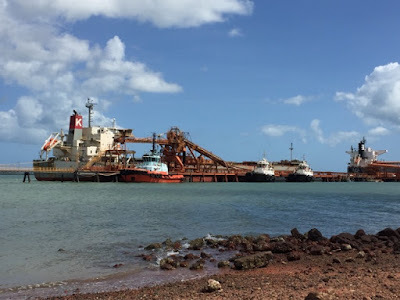 The present town was constructed mainly by Comalco ( Rio Tinto Alcan) and is now one of the worlds largest producers of bauxite which is used in the making of aluminium. We went and had a look at some fishing spot but were told by the guy in the fishing tackle shop we needed much bigger gear than what we had! We then drove out to Lake Patricia which was a pretty lake with a lovely picnic area - but no going in the water - CROCS!! !